Hi Redtags! Its great to be writing to you again from the sunny shores of Florida. The Hubble Space Telescope servicing mission just completed its tasking and the Space Station Crew Change-out mission will launch in 3 weeks. I got a few emails this week, so will start out with them. From Al Mosher comes this one: He was saddened about the passing of Fred Gerken and Ron Tubbs as mentioned in the last Checkpoints. The picture of Vic Apodaca and Jimmy Brinkman brought back some long lost memories. He has kept up to date through the class column and WILL be at the 40th Reunion. He then gave an update on Tucson and on his family. "To bring you up to date on Tucson, you should talk to Don Shepperd as he is building a house to retire to well up the mountain side here in Tucson. On the other hand, Ive been here since 75, when the town was small. I retired from Boeing in December, following 16 years in the AF and 15 in the ANG. I see by your column that Bill Haugen also retired from Boeing. Well have something to talk about at the Reunion. On the home front, all 5 of the kids are out of the house. One is a flight Attendant with Northwest, another is a cop in Virginia Beach, the third is an accountant in Washington, DC, number 4 sells insurance (trying to get on with USAA in Phoenix) and the little boy is assistant director at the Hilton Squaw Peak in Phoenix. So Ann and I travel quite a bit. Ann is a buyer for "The West" which is a needlepoint shop run by all volunteers. They gave over $100,000 to womens and childrens charities here in Tucson last year. Proud of her!!! Me- I just fly my model airplanes and sit in the sun. 31 planes at last count  its an addiction. Will keep in touch now that Im computer illiterate  and have lots of time. COUGAR." Got an interesting email from Phil Merkel. "Steve Mettler and I got together for dinner a couple of weeks ago. While rehashing old times, we got on the subject of the Air Force Museum at Wright-Pat and a certain O-2 that hangs in the museum and we had a brain excursion. Steve had flown that particular O-2 out of DaNang. Recalling that HP Martin had been killed at DaNang in a rocket attack and had likely flown the same airplane, we thought that a campaign to stencil HPs name on it might be in order. Anyone have some fetch with the AF Museum? Any FACs want to participate in the campaign? Topic for the Reunion? Cheers, Phil." To which, Butch Viccellio sent an answer: "Try Maj Gen Charles D Metcalf, USAF (Ret), Director of USAF Museum. A great guy, but dont get hopes too high. Most named aircraft in museum have personal relationship to deceased. Worth a try. Butch." 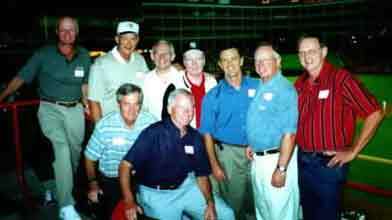 I am enclosing a picture of the gang at the Arlington Ball Park where they attended a major league baseball game. I wont say that old age is taking its toll but note that the two classmates in front were unable to stand while the seven in the back row needed a hand rail to stand erect. Front row, L-R: Grant Lannon and Tuck McAtee. Back row L-R: Mike Williams, Butch Viccellio, Bob Staib, Bob Keighery, Jerry Smith, Vern Wood and Jim DEntremont. Good picture, Redtags. Received a belated holiday greeting from Ted and Leslie Neff. They said that they were dejected because of a string of unhappy events that happened to friends and family, from losing friends in the Sept 11 attacks to losing friends to other events. Leslie almost lost her job as a flight attendant but got a last minute reprieve. From there, things picked up. They visited many family members including the grandchildren a few times, parents, god children, cousins and others. The year finally picked up and things are looking much brighter. They were finally able to send out the holiday greeting. (I can relate to that. I make my holiday newsletter, The Jambagram, a light-hearted spoof of the years events. I tried for 2 months to compose some witty lines but couldnt get into the mood until after Christmas.) Im glad you are back on track and feeling good about the world again. Thanks for the holiday greeting. Dave Holt took time to drop me an interesting story. "I was on my way home from my third trip to court in a small town in Georgia where their idea of a fund-raiser is to give speeding tickets to folks with out-of-town license plates. I was determined to fight the fine and insurance costs of a hugely-inflated speed was but was continued twice before they let me plea bargain to 10 miles per hour over the limit (which is what I was doing, on a four lane remote highway.) Anyway, I was boiling mad while I was driving home after paying a lesser fine, especially since the place is on the way to my lake house and Ill be there again many times. A car passed me and I noticed a purple heart license plate. I was struck with the idea that the cops in that town would be less likely to hit me for their fund-raisers in the future if I had a purple heart tag. When renewal time came I took my DD214 and had already written out my check for $173. I was pleased to tear up the check when they told me that I didnt have to pay. Georgia changed its law last year and now collects no ad valorem tax on one vehicle registered to a Purple Heart holder and they also give you the plate free." Very good information for Georgia residents. Thanks, Dave, and drive carefully. Gary & Jeannie Baughman sent a very nice picture in their holiday greeting but I couldnt print it because of column limits. So here it is. For those of you who havent had Lasik surgery yet, Gary is on the left and Jeanne is on the right. (IMAGE NOT YET RECEIVED - SORRY). I guess thats it for now.